Please join us this Sunday, July 24, for the Inaugural Freethought Fellowship meetup starting at 11am. Please note that this is not a traditional Spirit of Life UU service or a religious service at all. There will be no sermon, no order of service, with opening or closing words, collection or children’s story. This is an experiment with a once a month secular meetup focused on an informational, experiential or educational topic of general interest, with local music whenever possible and a potluck and conversation afterwards. For our first meetup, we’ll hear about our local creative community, and the growth of the Maker movement and public creative spaces throughout the Tampa Bay area. Our speaker Sunday is Chuck Stephens, a maker of all trades with expertise in a variety of media, ranging from recyclables to electronics. Chuck provides hands on workshops for youth and adults in everything from music making to stencil art, and also works with Eureka Factory, a local consulting and event production company, providing staff development for local libraries, and assisting with library makerspace build out, as well as with the production of Gulf Coast MakerCon, Tampa Bay’s oldest and largest maker festival. Chuck will have some of his handmade instruments and sound machines with him for everyone to see and enjoy. We’ll have good food, plenty of freethinking fellowship and conversation, and hopefully some local music – and at the very least – music! Doors open at 10:30, with a welcome and our guest speaker starting at 11am. There is no separate youth programming, however the talk and music are family friendly and recommended for youth 12+ . A donation of $5 is requested to help pay for facilities use and a stipend for our musician or speaker. 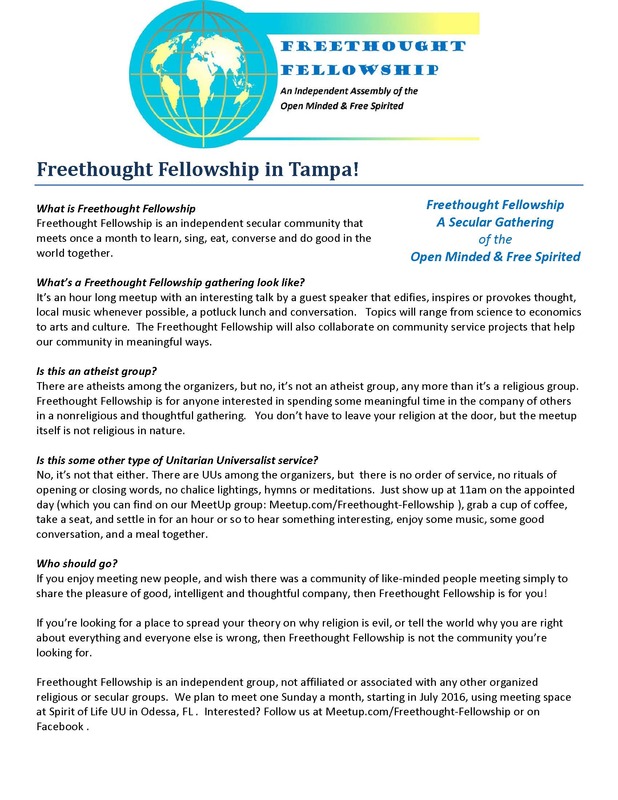 RSVP at Meetup.com/Freethought-Fellowship to help us get a headcount for light foods and refreshments. Bring side dishes to share, for a Freethought Potluck! Contributions for the Teaching Tools project in Hillsborough County to gather supplies needed by students who cannot afford to purchase their own is invited and very welcome. Please join us to help build civil and thought-full community in Tampa Bay!